"It's possible that some of my landscapes of Russian nature came out successfully because I have had to suffer and endure many terrible things. It seems to me that a cheerful person can't strongly feel Russian nature: in her there is so much melancholia, sad calmness, spiritual loneliness." 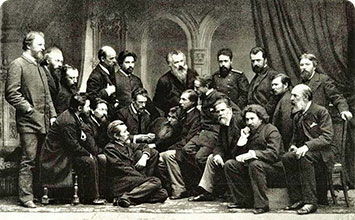 Established in 1870, The Society for Itinerant Art Exhibitions, commonly known as Peredvizhniki - meaning "Itinerants" or "Wanderers" - believed in representing subject-matter drawn from everyday life, with an accuracy and empathy which reflected their egalitarian social and political views. They worked across several types of painting, from landscape and portraiture to genre and historical painting, and by the close of the 19th century had become the most famous art movement in Russia. In 1923 the group was disbanded, but its impact was felt across many subsequent genres of Russian art, from Neo-Primitivism to Socialist Realism. The Peredvizhniki artists were perhaps best-known for their landscapes, paintings of archetypal Russian settings such as pine forests, wheat fields, and water meadows, which depicted their subject-matter with near photographic accuracy. At the same time, these landscapes were symbolically significant, representing the mood of the painter or viewer - as in the so-called "lyrical landscape" - or summing up some archetypal aspect of Russian culture or character. Peredvizhniki was the first group of Russian artists to recognize that the everyday Russian citizen was a worthy subject of their attention. They set about creating portraits and genre paintings which evoked aspects of the worker or peasant's daily life, or their hopes, fears, and allegiances. In an era where focusing on the common man or woman was synonymous with political radicalism, this work effectively sounded a clarion call for democratic reform. Peredvizhniki was the first great nationalist movement within Russian art. Rejecting what they saw as the Academy's slavish adherence to European taste, they forged a body of work which could become a talisman for an independent Russian spirit. Through their historical and religious paintings, for example, they presented the events and figures who had shaped the collective Russian consciousness. Like many of their peers in the French Realist movement of the mid-19th century, the painters of Peredvizhniki were striving not just for a new stylistic paradigm within their nation's art, but for sweeping social and political change. But if Gustave Courbet's involvement with the Paris Commune of 1870 symbolized an unrewarded revolutionary fervor, the Peredvizhniki movement survived to witness the Russian Revolution of 1917, and thus for the transformation it had willed: if not in the form it would have expected. Peredvizhniki developed out of The Artel of Artists, a cooperative commune established in 1863 following what was called the "revolt of fourteen." This came about when fourteen young artists, all studying at the St. Petersburg Academy of Art, rebelled against the choice of topic for the annual Gold Medal competition, "The Entrance of Odin into Valhalla". The group felt that the topic summed up the Academy's stifling focus on the Neoclassical tradition, and wanted to paint the reality of contemporary Russian life, learning from the examples of Realism and Naturalism in Europe. Ilya Repin's painting, arguably the defining work of Peredvizhniki, shows a group of exhausted men in harness pulling a barge along the sandy banks of the Volga. The composition emphasizes the harrowing effort of their labor, the diagonal line of workmen mirrored by the diagonal line of the shore (as if the whole scene were responding to and compounding the scale of their task). The laborers at the front of the line are larger, tilting forward with slack arms as if bearing down upon the viewer - the front man fixes our gaze pointedly - while the men that follow seem on the verge of collapse; at the end of the line, one figure slumps forwards, as if only held upright by the strap around his torso. In the distance to the left, a barge with sails unfurled can be seen on the still reflective waters: perhaps an ironic nod to Romantic landscape painting, emphasizing the abjection of the central scene. Repin began making preliminary sketches for this work in situ on the Volga in 1870, though the painting took three years to finish. Each of the barge haulers was based upon a real person whom Repin encountered during this preliminary visit, such as Kanin, a former priest, and Konstantin, a former icon painter. By using a wide, narrow canvas to accentuate the line of men, and by working with a high degree of naturalistic detail - creating precise tonal gradations, for example, and contrasting the lightness of the landscape with the shadow surrounding the men - Repin transformed what might otherwise have been a staid work of genre painting into a harrowing masterwork of Realism. Repin was the most famous artist in Russia by the close of the 19th century: the almost uncanny visual and psychological accuracy of works such as Barge Hailers influenced a whole generation of painters, and also had a deep effect on the nation's social conscience. The work was arguably all the more powerful because, as Vladimir Stasov wrote, it was "not painted to move the viewers to pity," but simply to "show [...] the types of people Repin saw." Alexei Savrasov's landscape painting shows a group of bare, twisted trees on a snow-covered hillside in front of a monastery. In the distance, beyond the steeple, a snowy expanse stretches to the horizon, generating a sense of enveloping isolation. The white of the snow and tree trunks, and the sharp angles of the walls and spires, create a kind of harsh clarity, suggesting the biting cold of the winter, but the top half of the canvas is dominated by billowing clouds and blue sky, and by the rooks which flock to the tops of the trees, heralding the spring. Savrasov painted almost exclusively in the landscape genre, and was associated with the development of so-called "lyrical landscape", a genre associated with the Peredvizhniki group in which the landscape becomes a mirror for human emotions. During the 1860s he had travelled to Europe, and had been influenced by Romantic landscape painters of the Swiss (Alexandre Calame) and British (John Constable) schools, but this work conveys a distinctly Russian spirit. It practical terms, it represents the area around the Ipatiev Monastery in Kostroma, a provincial town 200 miles north-east of Moscow. Seen as the high-point of Savrasov's career, The Rooks Have Come Back is at once a highly allegorical work, showing the replenishment of the landscape after winter, and a piece of almost informal-seeming naturalism. It was well-received when it was shown at the first Peredvizhniki touring exhibition of 1871, and was later admired by Isaac Levitan, a pupil of Savrasov's whose emotionally evocative landscapes would themselves become famous. As Levitan put it, the work is "very simple, but beneath the simplicity [...] is the tender artist's soul". This painting, depicting a water-meadow in the Russian countryside, is sometimes taken as the founding work of the "lyrical landscape" style, and is a classic example of Peredvizhniki landscape painting. In the foreground, scrubby vegetation is picked out with naturalistic detail; behind, a patch of earth leads in zig-zag pattern to a shallow lake, which in turn forms a curving diagonal drawing the eye upwards to the tree on the horizon line. The sky, filled with low-lying clouds, and the earth, are presented as contrasting areas of light and dark, with a shadow cast across the whole ground, stretching from left to right of the canvas. Though he was only twenty in 1870, Fyodor Vasilyev became one of the founding members of Peridvizhniki, and by the time he composed Wet Meadow in 1872 he had already collaborated with, and been tutored by, some of the most important artists attached to the movement. In 1867, he spent several months working on Valaam Island with the landscape painter Ivan Shishkin; in 1870, he travelled to the Volga with Ilya Repin - the trip on which Repin made his preparatory sketches for Barge Haulers - creating works in response such as Volga View: Barges (1870). A year later, in 1871, Vasilyev's painting The Thaw propelled him to fame - a copy was ordered by the family of the Tsar - as a result of which his friendship with Shishkin devolved into a rivalry. This particular work was created in the Crimea, while Vasilyev was attempting to recover from Tuberculosis. Its composition is based on memories of his native Russian landscapes, which perhaps helped to concentrate the strongly emotive mood of the piece. Vasilyev never recovered from his illness, dying in 1873 at the age of 23. However, by this point he had already produced a body of work that would have a profound influence on the development of landscape painting within the Peredvizhniki group, inspiring artists such as Isaac Levitan and Valentin Serov. This portrait shows the venerated 19th-century Russian writer Leo Tolstoy in three-quarter pose, gazing intently at the viewer. His hands lie in his lap, suggesting self-containment or withdrawal, while the black frock coat wrapped around his shoulders lends him a priestly demeanor. The wall behind the writer is blank, implying a life of austere solitude, though his face registers quiet, even humorous contentment. Ivan Kramskoi was the leader of the "revolt of fourteen" out of which Peredvizhniki developed, and was renowned for his portraiture, including works depicting everyday Russians such as Portrait of a Peasant (1868), and others focused on Peredvizhniki members, such as Portrait of the Artist Konstantin Savitsky (1871). Tolstoy was already famous by the time he granted Kramskoi the commission for this portrait - an honor sought by many artists, and only secured after some persuasion - and following the sitting the two would become close friends, corresponding on the state of Russia and the ideals of Russian art. Proper to Tolstoy's developing reputation as an ethical and religious figurehead as well as a great writer, Kramskoi conveys a clear sense of moral authority, and of humane and perceptive attentiveness. Many of Kramskoi's sitters became iconic figures, and it is likely that the qualities suggested by this painting enhanced the Tolstoy myth. As for Tolstoy himself, he grew to like Kramskoi so much that he included a character based on him in Anna Karenina (1877), and would later remark of his Christ in the Wilderness (1872) that "he knew no better Christ." This is an important work of Peredvizhniki art not only in showing the achievements of their leader, but also in indicating the channels of mutual influence between writing and painting which characterized Russian culture during the 1860s and 70s. Both Kramskoi and Tolstoy were working to define not only a new Russian art, but also a new moral and social conscience for their nation. This iconic landscape painting shows a field of rye just before harvest season. The intense color of the composition suggests the heat of late summer, the field burgeoning with its yield; in the foreground, wild flowers in blossom are picked out with the artist's customary precision, while the curve of the track draws the eye towards the center of the painting, echoed by the curves in the rye-stalks. Pine trees punctuate the skyline, and billowing clouds fill the air. Ivan Shishkin is remembered as the master of Perdvizhniki landscape painting, especially for his forest scenes and works depicting trees, such as Oak Grove (1887) and Forest Distance (1884). But whereas his contemporaries Vasilyev and Savrasov presented the landscape as a frame for the human condition, Shishkin was renowned for his scientific attention to natural detail; though this work is also replete with symbolic meaning. The painting depicts the rye fields of Lekarevskoe, at the edge of Yelabuga, the town where Shishkin was born and one of the engines of Russia's agricultural economy, known as 'Russia's Granary'. In this sense, the piece is a nationalistic paean to the wealth and plenitude of the Russian land. At the same time, it has a more poignant, biographical significance, having been composed based on material gathered during a trip to Yelabuga in 1877, after the death of Shishkin's wife and two sons. The two barely discernible figures in the center of the canvas are assumed to be Shishkin and his daughter - his last surviving relative during that trip - while the two black swallows in the foreground, and the larger, dead bird on the road, seem highly allegorical. The painting thus represents the loss and replenishment of life - human and natural - whilst also being a meticulous representation of a particular landscape, one which epitomized everything that Shishkin loved about the Russian countryside: "expansiveness; space; fields of rye; God's paradise; Russian riches..." It was his ability to convey the character of that landscape both realistically and emblematically that made him an enduringly influential figure in modern Russian art. This canvas shows four bears, a mother and her cubs, playing around a fallen tree in a forest glade lit up by the morning sun. The triangular arrangement of the animals matches the triangular shape formed by the fallen pine at the center, which directs the eye towards the haze of sunlight behind. The cub to the right, outlined against the light, creates another focal point, while the verticals of the surrounding trees, reaching up beyond the top of the canvas, immerse the viewer in the woodland scene. A bluish morning mist clings to the trunks on the left-hand side. Painted around a decade after Rye, Morning in a Pine Forest is one of various works which Shishkin created throughout his career depicting lush coniferous woodland, also including Pine Forest (1866) and The Sestroretsk Forest (1896). The natural scene is recreated in such detail - each pine needle in its variation, the plants mingling in the foreground, the backwards-curving trunk behind the fallen tree - that the effect is of a near-photograph freshness. In this sense, the work is a quintessential example of Shishkin's oeuvre, but it is relatively unusual in representing animals. Indeed, when the painting was first shown at a Peredvizhniki exhibition, it was presented as a collaboration with Konstantin Savitsky, a painter known mainly for his working-class portraits who was thought to be responsible for the depiction of the bears. This is quite likely, but Savitsky's signature was later removed from the piece, and it was credited solely to Shishkin. This painting was well-received at the time, and remains popular to the point of cultural ubiquity in Russia. It is regularly cited as one of the nation's favorite paintings, and since 1925 a version of the image has appeared on the wrapper of the popular Clumsy Bear chocolate bar. This atmospheric landscape painting depicts the Vladimirka Road, part of the Great Siberian Road that led from Moscow to the wilderness areas of Northern Russia. The surface of the track seems to be broken up by grass and wagon ruts, as it cuts upwards from the left foreground, forming a disappearing diagonal reaching to the horizon. The vastness of the land and sky is emphasized by their emptiness - save for a single clump of trees, and a tiny church spire in the distance - and by the presence of a single pilgrim, passing an icon-and-cross station located to the right of the road. Levitan was a master of plein air painting. Often creating his works on location, he had the ability, like the French Impressionist painters of his era, to capture the atmosphere of a natural setting on a particular day, at a particular time, through an intuitive use of color. In this case, the atmosphere generated might seem subtly oppressive, the sky an icy blue-grey, the horizon a source of shadow rather than light. That mood is complemented by the impression of lonely penitence conveyed by the presence of the pilgrim, and - if the viewer knows anything of the location they are looking at - by the cultural associations of the landscape itself. The Great Siberian Road was associated with the transportation of prisoners north from Moscow to Siberian workcamps or to exile, a journey famously taken by Raskolnikov in Dostoevsky's Crime and Punishment (1866), and recalled in the memoirs of the political activist Alexander Herzen. The poet Nikoly Nekrasov had also presented a (fictionalized) account of the journey in his 1872 work Russian Women. In its cultural and emotional allusiveness, Levitan's work is a classic example of the Russian "lyrical landscape"; indeed, he brought to all his natural scenes a poetic sensibility to match that of the writers who had described the journey along the Vladimir Road. Such psychologically affecting works would have a profound influence on subsequent Russian painters, including the Impressionist Konstantin Korovin and the Symbolist Mikhail Nesterov. This classic late work of Peredvizhniki genre paintings shows two children driving a small herd of calves across a shallow ford in a rural village. In the foreground, the track is deeply rutted by coach-wheels, filled with water lit up by the sun, while the children's movement away from the viewer, and their depiction mid-stride, creates a sense of informality and photographic accuracy, as if relaying a particular moment in time. In compositional terms, the road-surface forms a diagonal sweep across the canvas, while the angle of the fence on the far side of the ford parallels the line of the hill beyond. Pymonenko was a second-generation Peredvizhik, born in 1862, just a year before the "revolt of the fourteen", and only eleven years old at the time of the first Itinerant Exhibition. Enrolled as a member of the group in 1899, he produced scenes of working-class and peasant life, many of which, such as Victim of Fanaticism (1899), contain a strong element of ethical and social commentary. This work is relatively unusual in the simple, idyllic nature of the scene depicted, though perhaps the prominent groove-lines imply the children's future lives unfolding along predictable and arduous paths. Works like A Ford, and Matchmakers (1882), sum up Pymonenko's detailed and empathetic attentiveness to everyday Russian life. He was the best-known Ukrainian artist associated with Peredvizhniki, and later in his life would forge an unexpected connection with the future Suprematist painter Kazimir Malevich, a pupil at the Kiev Art School where Pymonenko worked from 1906. This painting, depicting a sunset on the Dnieper River, is dominated by a large luminous body of cloud. The red glow of the sun behind it, reflecting on the river, fills the entire canvas with unearthly light, while in the foreground the thatched roofs of huts can just be made out. However, the viewing point appears to be in mid-air, so that the scene below is flattened and miniaturized, the top half of the canvas given over entirely to the representation of the sky. The Ukrainian-born artist Arkhip Kuindzhi initially worked as a retoucher in a photography studio, and had considered opening a studio himself before becoming a painter. As a result, his work, like that of the French Impressionists, was deeply influenced by photography: this piece is exemplary in using unexpected color combinations and fine tonal gradations to capture the dramatic effects of sunlight in realistic ways. His paintings often present vast, empty panoramas, in which the features of the landscape are reduced to a minimum and the refraction and reflection of light becomes the primary object of attention. In this case, the scene becomes almost abstracted in its minimalism, the river banks forming homogenous dark bands on either side of the luminous strip of water. In its exaggerated, emotionally expressive use of color, and in its move towards a kind of compositional abstraction, Kuindzhi's work became a touchstone for Russian painters of the Symbolist and Expressionist schools, such as Nicholas Roerich, Konstantin Bogaevsky, and Arkady Rylov. In this sense, his work indicates the threads of continuity that run from Perdvizhniki Realism to later movements in Russian and European art, suggesting the significance of the movement as a whole.